For more than 20 years, Mark and Pam Huffer have spent the weeks before Thanksgiving decorating their house with thousands of Christmas lights, including a 24-foot-tall tree that is trimmed and strung with lights to look like a Santa Claus as tall as their house. 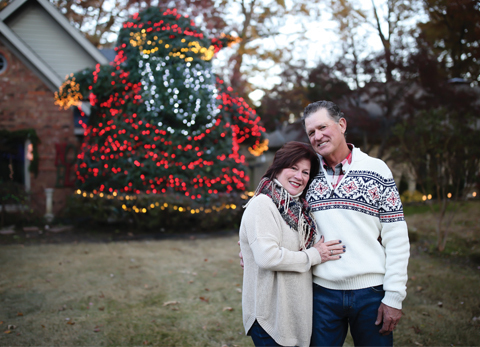 The couple loves Christmas and enjoys the joy their well-known tree and décor bring to the community, which is why they are dedicated to continuing the festive Christmas tradition. The Santa tree officially got its start in 1996 when Pam was working at Bennett’s Nursery. She worked with a man named Benoit, a second generation topiary artist from Belgium, who had something festive in mind when he came over to see the Huffers’ landscaping. “I wanted the tree trimmed because it was a holly and it was out of whack,” said Pam. “I thought he would make it bell-shaped, and while we were out there talking, he said he could make it into a Santa Claus. He told me how many lights to get of what color, then I went back to work. After I came home, there was Santa right there in front of my house. It only took him about three hours to trim and put up the lights. He had a vision, and he brought it to life. That first year, Mark estimates that the tree was about 10 feet tall and required a few hundred lights to make up Santa. Today, the tree is 24 feet tall and requires more than 4,000 larger lights. Pam describes herself as a Christmas addict and says that Christmas is her favorite time of year, which is why the Santa tree is something she and Mark have continued to do each winter. They even added extra electrical outlets to the outside of their house to handle the thousands of lights after they realized all the lights would go off every time they turned on the vacuum. “It has been so fun,” said Pam. “People start asking us in September when Santa will be ready, and I tell them he will be lit by Thanksgiving. We have people come by and take pictures with him, and we love it. … Each year he takes more lights. One year, my daughter ran to Memphis because we couldn’t find any more of the red lights we were using in Jonesboro. The rest of the house has evolved along with the notoriety of the Santa tree. Mark estimates that he uses between 20,000 and 25,000 lights total by the time they are done. Although many people from neighbors to busloads from area churches have been coming by to see the Santa tree since that very first year more than three decades ago, the Huffers say they get many families each year who stop by in amazement for the first time. “We still have people drive by and see it for the first time and get kids out of the car and take pictures with Santa,” said Mark of why it’s important for them to keep the tradition going. “It makes us feel good to know we are doing something that other people enjoy. The Huffers’ house and their Santa tree, located at 2304 Stonebridge Drive, will be lit up for the public through Jan. 1.